So it’s time to replace your roof and you’ve done your homework. You’ve researched various types of roofing materials, from genuine stone tiles and natural cedar shakes to the latest in rolled metal roofing. You’ve decided that asphalt shingles are the way to go. Not only do they offer you the greatest variety of color blends and styles, they’re also among the most affordable options to protect your home, family and property against the elements. Of course, there are other reasons you might want a new roof. Perhaps you’re updating other exterior elements or you want to boost your home’s curb appeal before putting it on the market. Whatever your reasons are, congratulations on a very wise decision! Now that you’ve settled on asphalt roofing shingles, though, sifting through all those options can feel a bit overwhelming. That’s why the roofing experts at IKO have put together this comprehensive review of IKO shingle products. Our goal is to explain the differences and advantages of every roofing shingle in our lineup, using simple terms that are easy to understand and beautiful pictures of IKO’s asphalt shingles on actual homes. As a leading global manufacturer of quality roofing products, we’ve been doing this for decades and we know what we’re talking about. Don’t worry. This is not a sales pitch! We just think it’s important that homeowners fully understand what’s available in order to make the most informed decision that’s best for them. Ready? Let’s go. One of the reasons people may have trouble navigating the available choices of asphalt roofing shingle is that some terms are generic and well-understood within the roofing industry while others are used by individual shingle manufacturers to differentiate their brands or product lines. Architectural shingles. Laminate shingles. Dimensional shingles. Composite shingles. Fiberglass shingles. Designer, premium and luxury shingles. Strip roofing? 3-tabs? These terms might describe a shingle’s look, what it’s made of or even what its function is. Then you have standard industry jargon like dimensional thickness, profile, shadow bands and Title 24-compliant, and abbreviations such as AR and IR. Small wonder it’s so confusing! At IKO, we have four categories of asphalt roofing shingles that we call “collections.” We’ll illustrate and describe each one of them in detail below and we’ll explain the terms as we go along. Within each collection, we’ll also give you a comprehensive review of IKO shingles that describes each shingle’s characteristics, advantages, limited warranty coverage and more. You’ll also find color swatches of the blends available for each member of the collection. At the end of this article, we’ll sum it all up with a handy chart so you can compare them all side by side at a glance. Let’s Continue Our Review Of IKO Shingle Products With An Anatomy Lesson. The cut-away illustration below shows you what goes into every type of IKO roofing shingle we make. Learn more about the function and importance of each individual component. These five components are bonded together in line at our manufacturing plants to form a single layer, which is the starting point of all IKO asphalt shingles. Notice that the core component below (3) is a non-woven fiberglass mat. This is the industry standard because of the strength, durability and enhanced fire resistance it offers. When you see the phrase “fiberglass shingles,” it means that the embedded mat at their core is made of fiberglass, regardless of the shingle’s type, style or appearance. You may also see the term “composite shingles.” All fiberglass shingles are considered composite shingles, but not all composite shingles are fiberglass shingles. Plastic and rubber shingles are also considered composites, but they’re usually shaped like tiles. The Top Surface Layer Consists Of Mineral Granules That We Quarry And Crush Ourselves. They protect the underlying asphalt layer from the sun’s ultraviolet rays which can potentially damage or cause it to break down, making the shingle brittle and less flexible. They provide color and texture to create the beautiful roof you see from street level. IKO uses an exclusive, advanced color blending technology for some of the most stunning looks and effects available. They contribute to the shingle’s fire resistance. Professional roofing crews install asphalt shingles with a nail gun, using four to six nails per shingle depending on a number of variables, such as size, construction, roofing conditions, location and temperature. Strips of tacky sealant help to adhere the shingle. The sun’s radiant heat activates this sealant to further strengthen its adhesive bond to help prevent wind-uplift and blow-off. Come to Terms With These Two Terms: AR and IR. Have you ever seen a roof with black streaks or discolored areas as shown in the photo below? Discoloration and unsightly streaks like these are most commonly caused by the growth of blue-green algae colonies, usually in maritime climates or regions of high humidity. While they’re not harmful, they can seriously ruin the look of your roof and your home, and be very tricky to clean. IKO and other asphalt shingle manufacturers embed special granules into the top surface of their AR-designated shingles to help inhibit such algae growth. Before we review the different types of asphalt roofing shingles IKO makes, here’s one more industry term to learn. “IR” stands for “Impact Resistance.” It often appears as part of the shingle’s name too. Certain shingles are engineered to perform better under the impact of hail, and these shingles have earned a Class 4 Impact Resistance Rating which IKO is pleased to present on its IR shingles for the sole purpose of enabling homeowners to obtain a discount on their home insurance premiums, if available in their area. This rating is not to be construed as any type of express or implied warranty or guarantee of the impact performance of this shingle by the manufacturer, supplier or installer. For further details see the Specification Test Standard for FM4473 Impact Resistance. If you own an estate home or other high-caliber property, IKO’s Premium Collection will appeal to and satisfy your sense of aesthetics while providing the ultimate weather protection. 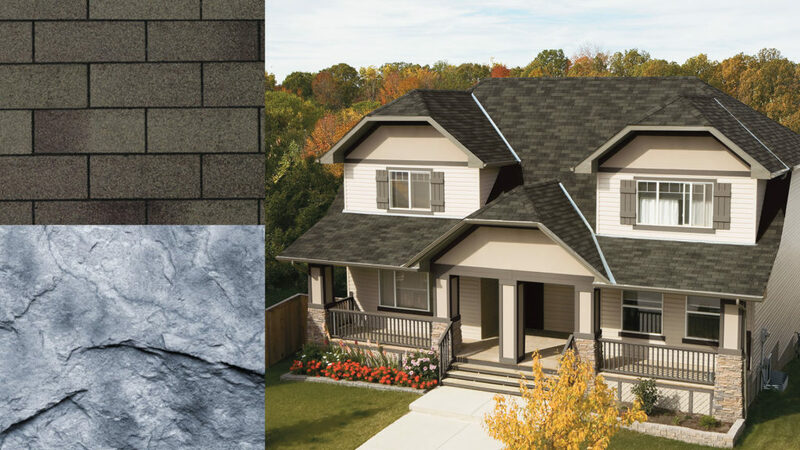 All three lines in this suite of luxury laminated architectural asphalt shingles are engineered to emulate the sophisticated, sought-after designer look of natural slate tiles or genuine cedar shakes without their associated maintenance worries and expense. Whether your home’s architectural style and your own personality are traditional or contemporary, rural and laid-back or urban and chic, you’ll find your match in our Premium Collection. You may have noticed that, in the second paragraph above, we described the shingles in this collection as “luxury laminated architectural” shingles. Let’s take a closer look at what that string of words means. Our Premium Collection is called “luxury” because it’s our ultimate offering in terms of aesthetic appeal. You can imagine that it’s not easy to recreate Mother Nature’s beauty of genuine wood or natural slate. Achieving that look in an asphalt shingle requires subtle color changes or gradations, a deep dimensional profile or depth and very specific cuts. To create that dimension, we take two or more single layers of shingle and laminate or bond them together to build the shingle’s depth. This multilayer construction not only provides depth for appearance’s sake, it gives our Premium shingles weight, to lie flatter on the roof. The heavier the shingle, the harder it is for the wind to get underneath, lift it up and blow it off. IKO Armourshake shingles are the largest and heaviest shingle we make. They’ll give your home the classic look, charm and warmth of genuine wood shakes at a much more affordable cost. You won’t have the worries of regular maintenance, fire or termite damage often associated with real wood (which may be prohibited by local building codes in your area). Their elegantly contoured profile, extra-large dragon’s teeth and overall large exposure combine to create the textured, basket-weave look of hand-cut shakes. Available in truly stunning color blends, they redefine high definition to give your home tremendous curb appeal and a lasting look of luxury. IKO Armourshake roofing shingles are constructed of two fiberglass mats laminated together for strength and durability. Their weight helps them lie flat to resist heavy winds and rain. Thanks to their larger-than-average size, these premium laminated architectural shingles go down fast, to help minimize installation time, labor and cost. Built-in blue-green algae-resistant granules help keep your new roof looking as great as it performs and a Class A Fire Resistance rating offers you the peace of mind that natural wood shakes can’t. 1 See Limited Warranty at IKO.com for complete terms, conditions, restrictions and application requirements. Shingles must be applied in accordance with application instructions and local building code requirements. 2 High Wind Application is required. IKO Armourshake in Weathered Stone. This color blend shows how closely these luxury shingles resemble genuine cedar shakes. IKO Armourshake in Shadow Black. Here you can see how the thickness and profile of these shingles create the look of hand-hewn wood shakes. Genuine slate tiles have been gracing homes and public buildings for centuries, because of the timeless beauty of natural stone and its remarkable durability. IKO Crowne Slate asphalt shingles can give your home the sought-after, high-end look of a genuine slate roof at a reasonable cost and without the challenge of finding a specialized contractor to install them. They’re much lighter in weight than real slate tiles, and thanks to their oversized exposure, IKO Crowne Slate shingles are designed to go down fast and easy. Two gorgeous color blends emulate the subtle, yet dramatic, color variations of natural slate and the shingles’ uniformly square profile creates the characteristic cut of quarried, hand-hewn stone tiles. This effect is further enhanced by their dimensional thickness. Their durable, two-layer construction consists of a lower shim coated with oxidized asphalt and upper dragon’s teeth saturated with modified asphalt, laminated together to form a heavy-weight fiberglass shingle to help resist wind uplift, blow-off and water penetration. IKO Crowne Slate shingles have special granules embedded in their surface for built-in blue-green algae resistance and protection against UV radiation. IKO Crowne Slate in Regal Stone. In this close-up, you can see how the square cut and gradations combine to create the look of natural slate tiles. Note also how the matching hip and ridge cap shingles accentuate the roofline while protecting vulnerable areas. IKO Crowne Slate in Royal Granite. Here you can see that the look of a genuine slate tile roof can work just as well on a more casual or rustic type of home as on a more stately or formal one. IKO Royal Estate shingles are very similar to IKO Crowne Slate in terms of their luxurious, natural-stone appearance and multilayer laminated fiberglass mat construction for superior weather performance. The main difference is that IKO Royal Estate shingles are designed with a random-cut profile rather than a uniformly square one. Additionally, four dramatic color blends in varying shades of light and dark combine with this random look of hand-hewn tiles to create a beautifully textured appearance for tremendous visual appeal. Whether you want your home to harmonize with its natural surroundings or be a standout in your neighborhood, you’re sure to find a color blend that suits your home’s style and your personal taste. Like IKO Crowne Slate, IKO Royal Estate shingles are also a heavyweight performer yet they’re much lighter in weight than natural stone, for fast and easy installation by qualified roofers. No expensive, specialized contractors needed. Even modern, minimalist homes like this can be given the “Royal Estate” treatment. The random cut and color blend add much-needed visual interest to this huge expanse of roof. The hand-hewn appearance of natural stone is due to the random cuts of this shingle, as clearly shown in this photo and enhanced by the varying light and dark color shades. Do you live in an area where severe weather conditions such as high winds, hail, ice and snow storms, frequent thunderstorms and temperature extremes prevail? If so, you’ll definitely want to consider the two options available in IKO’s Performance Collection: IKO CambridgeTM IR with ArmourZone® and IKO Dynasty® with ArmourZone®. Both of these high-quality, laminated architectural shingles are engineered to provide your home with exceptional protection against wind uplift and water penetration. An extra-thick coating of weathering asphalt around a non-woven fiberglass mat core provides them with superior weather resistance, even in extreme cold. They’re among the most durable shingles on the market. On top of that, they’ve been fortified with the addition of ArmourZone. What is that? It’s a 1-1/4-inch nailing surface that’s reinforced by a tear-resistant, woven band that provides more fastening strength over a wider surface area of the shingle. When installers are “in the zone,” the nails they place there are optimally positioned to resist nail pull-through and shingle blow-off, even in high winds of up to 130 mph (210 km/h). The ArmourZone nailing area and the shingles’ larger-than-average 5-7/8-inch exposure make them a favorite with contractors because they are so quick and easy to install, helping to minimize the time and labor involved. When activated by the sun’s heat, a special sealant along their bottom edge becomes extra-tacky, further strengthening the bond to offer you maximum protection against wind uplift and blow-off. We embed colorfast, algae-resistant copper granules into these shingles to help inhibit the growth of blue-green algae that can cause unattractive black stains, streaks and discoloration. Additionally, IKO Cambridge IR shingles carry a Class 4 Impact Resistance rating, which may entitle you to a discount on your home insurance premium. * Ask your agent. The other difference between the two comes down to the color blends created by IKO’s exclusive, advanced color blending technology. * This impact rating is solely for the purpose of enabling residential property owners to obtain a reduction in their residential insurance premium, if available. It is not to be construed as any type of expressed or implied warranty by the manufacturer, supplier or installer. 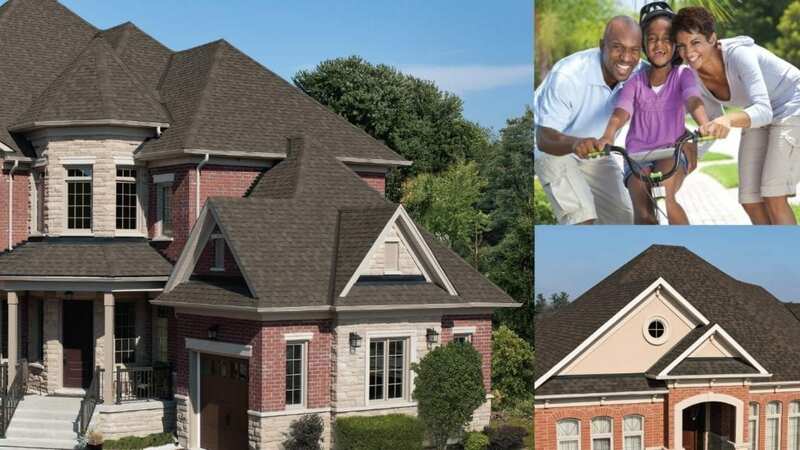 IKO Cambridge IR shingles with ArmourZone are the perfect choice if you want your new roof to harmonize well with your home’s natural surroundings. The available color blends make use of nature-based hues of earthy browns, stone-colored greys and black. These color blends have a universal appeal that will suit a wide range of architectural styles from traditional homes to contemporary and create a vibe that varies from casual and laid-back to stately and chic. Some of our IKO Dynasty with ArmourZone shingles are definitely not for the faint of heart! These unique, bold color blends are the most eye-popping and spectacular we make. Homeowners have told us that admiring friends and neighbors frequently ask what kind of shingles those are because they’re so unusually striking. If your style is to make a slightly quieter statement, don’t worry. This line has a few more traditional color blends too. Skilfully blended, multiple colors combine with extra-deep shadow bands to create a highly textured appearance that provides your home with tremendous curb and visual appeal. Stand out or blend in? The choice is yours. Either way, IKO Dynasty with ArmourZone is a true performer in every respect. IKO Dynasty with ArmourZone shingles help resist nail pull-through even at high winds and carry a 210 km/h (130 mph) limited wind warranty1 with the use of only four nails. Our Architectural Collection includes IKO CambridgeTM and IKO CambridgeTM Cool ColorsTM. The latter came about because of the need to be Title 24-compliant in the state of California. Except for the granule technology involved in the color blends (more on that below), the two lines are otherwise identical. There are many excellent reasons why IKO Cambridge is the most popular laminated architectural shingle we make, among homeowners and professional contractors alike. For starters, they’re built around a flexible fiberglass core that’s been given an extra-thick coat of weathering asphalt, making these shingles heavier than most competitors’ comparable shingles. This imparts superior weather resistance, even in extreme cold. They’re among the most resilient, durable shingles you can buy. Also, unlike some manufacturers, we use a straight cut rather than an angled one to give them the stunning look of genuine wood shakes while providing the durability and affordability of asphalt shingles. We stagger the size and position of these cuts to create a random, varied pattern called “dragon’s teeth” and add deep shadow bands for contrast. Taken together, this emulates the rich texture of real wood shakes. IKO Cambridge shingles come in IKO’s special “Advantage” size. They’re larger than many other shingles on the market, which means that they can be installed much more quickly and easily. The finished roof also benefits aesthetically from this larger 5-7/8-inch exposure. A printed nail line guides installers to position and fasten the shingles correctly, to help keep them on the roof and prevent them from blowing off in high wind. No matter where you live or what style of home you have, you can choose IKO Cambridge shingles with confidence in their beauty and performance. Special colorfast algae-resistant granules embedded in the shingles’ surface will help inhibit the growth of blue-green algae that can cause discoloration and unsightly black streaks. Of all the shingles we make, IKO Cambridge offers you the greatest selection of color blends. The California Energy Commission Building Standards Code Title 24 mandates that all residential and commercial structures in the state install roofs with minimum solar reflectivity. California has established 16 climate zones based on representative weather and temperature data. IKO Cambridge Cool Colors asphalt shingles can be used to meet the reflectivity requirements of 2016 Title 24 Part 6 Cool Roof Requirements to improve your home’s energy efficiency and potentially help reduce its carbon footprint and cooling costs while elevating its curb appeal. Here’s how. IKO Cambridge Cool Colors are more reflective than standard shingles. We embed them with specially designed roofing granules (in addition to the algae-resistant granules mentioned above). Thanks to this high-reflectivity technology, less infrared radiation or heat is allowed to enter your home through the attic. Absorbed radiation is re-emitted back to the sky instead. This means that the roof and the home it’s protecting stay cooler than a comparable building roofed with traditional shingles. Exactly how much energy can be saved will depend on your area’s geography, climate, utility rates, the home’s HVAC system and other factors. IKO Cambridge Cool Colors are not available in all geographic areas and color selection may vary by region. IKO CambridgeTM Cool ColorsTM in Dual Grey. For many decades, the only kind of asphalt shingle a homeowner could get was what we call the “traditional,” “strip” or “3-tab” shingle. They’re often called “3-tab” because, as you can see below, each individual shingle is visually divided into three rectangular tabs of equal size, to create the impression of three separate tiles. Using its color-blending technology to vary the shades of each tab in a particular color blend, IKO has achieved an amazing level of depth for an asphalt shingle of monolayer or single-layer construction. Because traditional 3-tab shingles are the most basic type to manufacture and the lightest to install, they’re also among the most cost-effective. Homebuilders and architects frequently specify them for constructing economy-priced or affordable housing. As a homeowner, you can use them as replacements to repair an existing strip-shingle roof or to cover and protect tool sheds, pool houses, gazebos or other outdoor structures, even dog houses, at a very reasonable cost. The most basic type of roofing shingle, the 3-tab is a single layer that lies flat on the roof. Even so, you can see in the photos shown here how attractive it can look on different styles of home. Get back to beautiful basics with IKO Marathon Plus AR and IKO Marathon. These traditional shingles are of solid construction and ever-popular 3-tab design. Thanks to their large metric size, they can be installed quickly to save time and labor, making them a very cost-effective choice for your roofing project. They feature IKO’s Fastlock™ modified bitumen sealant. It’s thick and aggressive, to promote a strong bond and help guard against water penetration and wind uplift. IKO Marathon Plus AR shingles are made with special colorfast algae-resistant granules embedded in the surface layer, to help inhibit the growth of blue-green algae colonies that can cause unsightly streaks and discoloration. IKO Marathon Plus AR and IKO Marathon shingles come in a wide variety of color blends, although selection varies by region. They’re among the top of their class when it comes to performance and value. They even carry a Class A Fire Resistance rating. Skilful color blending has created visual texture, despite the flat, low profile of this traditional 3-tab. IKO strives to accurately reproduce the screen images of the shingle swatches and house photos shown. However, due to manufacturing variances, the limitations of your monitor resolution and the variation in natural exterior lighting, actual colors may vary from the images you see. To ensure complete satisfaction, please make your final color selection from several full-size shingles and view a sample of the product installed on a home. Color availability varies by geographic location. Not all colors may be available in your area. Here are some tips on how to choose the right shingle color. You can also download IKO’s FREE app to see how any of our shingles will look on your style of home and coordinate with other exterior elements. You can even upload a photo of your own home to try on different shingles. Protect and Beautify Your New Roof With Matching IKO PRO 4 Roofing Components. Asphalt roofing shingles are your home’s first line of defense against the elements but they’re at their most effective when they’re one part of a complete, integrated system. Ridge cap shingles are designed to protect the vulnerable areas of your roof against wind uplift and water penetration. 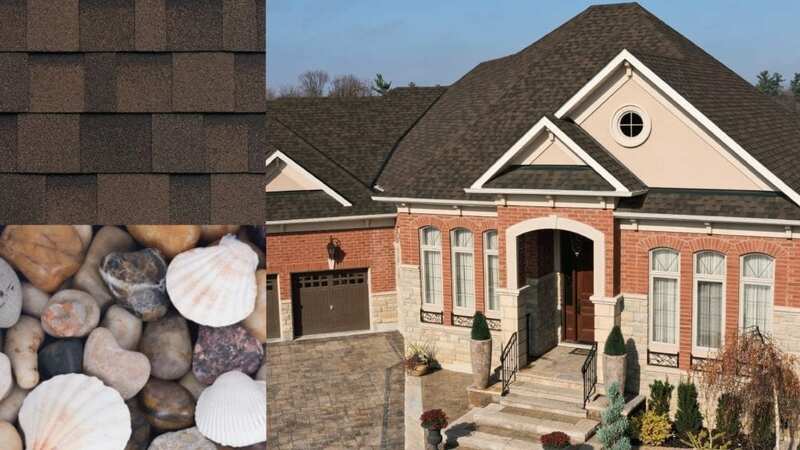 They’re available in color blends that complement the various shingles we make and will further enhance your home’s appearance by creating an eye-catching roofline. IKO RoofGard-Cool Grey and IKO Stormtite® synthetic underlayments provide total deck protection, while IKO GoldShield, IKO ArmourGardTM and IKO StormShieldTM ice and water protectors help the eaves fend off water penetration caused by ice dams or wind-driven rain. IKO Armour Starter and IKO Leading Edge Plus starter strips are precut to size to save installers valuable time when laying down the first course of shingles. Fast, easy and convenient to use, they help minimize material waste and keep the job site cleaner. Learn even more about each of our shingle products and check out these charts for a quick comparison of the shingles we’ve described in this article. Not all members of this Traditional Collection available in all areas. Selection varies by geographic region. We hope that this review of IKO’s different grades of shingle products has helped you make a more informed decision to protect your home and family. To see actual samples of IKO shingles, ask an IKO Sales Representative or get in touch with an IKO Professional ShieldPro Plus+ Contractor today.